I’ve been working with the Morikami for the past 10 years; so for half that time, I have witnessed Fushu Daiko’s thundering influence on Hatsume crowds. Amazing cannot describe the energy and excitement when they take the stage. When I first started writing for the museum, I knew NOTHING of taiko drumming, so my family and I traveled down to their warehouse-like studios in western Ft. Lauderdale. They were rehearsing at night, and we stood silently by and listened. It felt like a train was barreling through that bay. The wooden sticks flew up and down in synchronized rhythms, as people of all shapes and sizes, sweated out the music. It looked more like a workout than a musical performance. Of course, it was both. I learned that when my family and I took a taiko drumming workshop at the Morikami several years later. Inside the auditorium, we were paired up with a big taiko drum and a pair of fat wooden sticks. You assume a warrior-type, yoga stance to support your body and hit the drum with measured ferocity. Everything hurts when you’re done. Your back, your legs, your hands, your arms. At that moment, when I walked off the auditorium stage, sweaty and tired, I gained new respect for the men and women of Fushu Daiko, who perform three times a day for two days at Hatsume in sets that can last for 30 minutes or more. 1) Stake a seat early if you want to see the action up close. By the time the drums start thundering, it’s standing room only, and I always get stuck behind a really tall dude. 2) If it’s hot, wear sunscreen, but don’t put up an umbrella or some other covering. It’s not nice to the people behind you, who want to see the stage too! 3) Don’t expect the drummers to be Japanese. 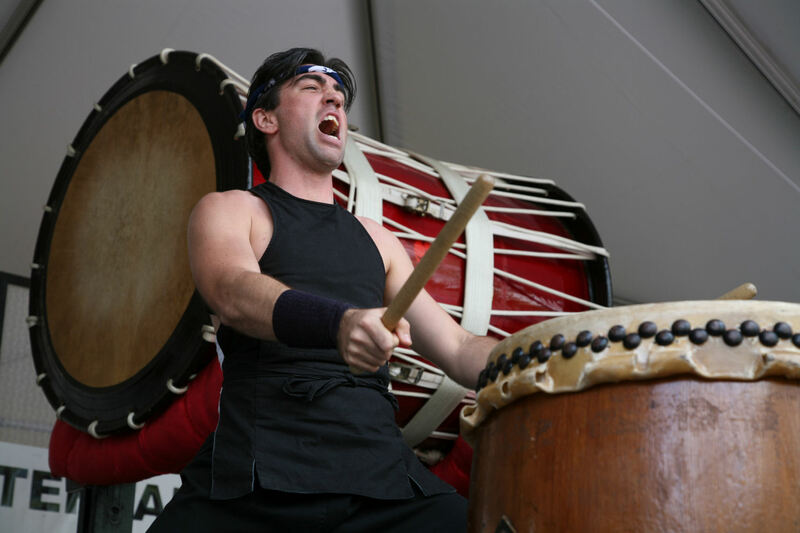 There are some drummers of Japanese heritage in Fushu Daiko, but the diversity on stage is representative of the diversity of South Florida – black, white, Hispanic, male, female, young, old(er) – all have become part of the troupe that sends the booming message that it’s Hatsume time! Shopping, cooking, wrapping, working. Repeat. Repeat. And repeat again. Throw in making holiday parties on top of holiday deadlines, out-of-town visitors and/or holiday travel, and you, my friend, may need some drum therapy. Yes, we all know the grand holidays are the days of joy, mirth and more than a little good eating. But with all that merriment comes a fair share of stress, and there’s no better way to relieve that teeth-grinding feeling than beating a big, round taiko drum. I know because I’ve done it. The Morikami tapped into the curiosity in the festival crowds and gave their visitors a chance to bang that drum. It’s not as easy or as coordinated as it looks — especially for the untalented and uninformed. My family and I took the opportunity to attend a taiko drum workshop in the Morikami’s theatre. First, you get an education on the purpose of the drums, the lore they hold and the power they encompass. The one-hour verbal lesson by a leading member of the performing ensemble, Fushu Daiko, is supposed to prepare you for the physical part of the lesson. It does not. That’s because nothing readies you to hold two wooden sticks in your hands, get into a deep warrior pose and pound away for a second hour. You sweat, you ache, you get a little dizzy, and you look and sound just awful. (Getting good takes years. Being bad takes no time at all!) But you do receive a deep, abiding respect for the art and skill of mastering taiko drumming; and you’re so tired, you don’t have time to be stressed. Three workshops are coming up on December 6 at 10:15 a.m., 12:45 p.m. and 3 p.m. If you’re thinking someone in your life would appreciate a workshop, gift them the pleasure. Upcoming workshops, also held three in a day, are January 31, Feburary 28 and March 28. They are $50 per person. Call 561-495-0233, ext. 210 for reservations. Space is limited. The Morikami recommends wearing comfortable clothes and shoes and no jewelry. I recommend eating your Wheaties, drinking some water and planning to nap afterwards. Really. Does he look stressed to you? 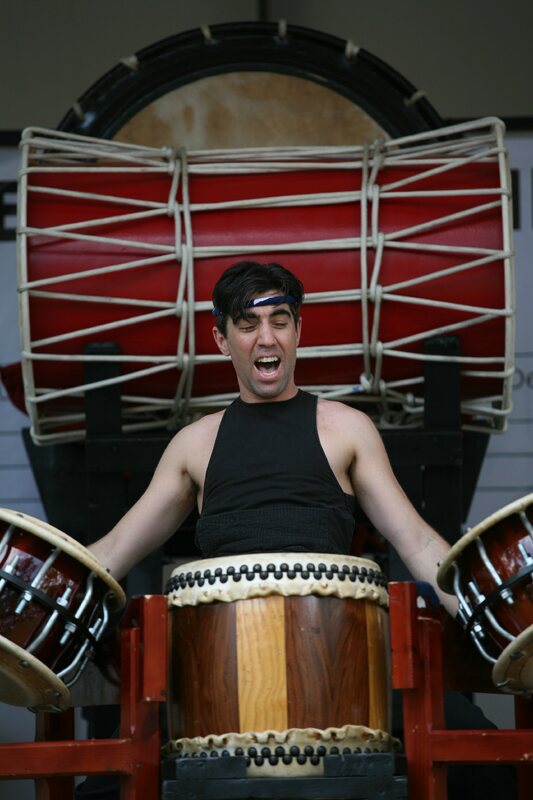 Try taiko yourself on Dec. 6 at The Morikami.